first-year birds having darker colors and young fledglings and old birds having a pinkish color. Older birds (older than 5 years) molt into longer wing and tail feathers. Continental species typically have short wings (2.2-2.6 in [55-65 mm]) and weigh 0.3-0.5 oz (9-15 g), with a cline following Bergmann's rule (larger in higher latitudes), but the derived island species and races tend to increase bill, leg, and body sizes. For example, in the eastern races of silvereyes (Z. lateralis) in Australia and New Zealand, a comparison between local populations indicates that the South Island population of New Zealand is the largest and the northern Australian population the smallest. At northern sites the winter populations are diluted by large southern migrants, except on wooded islands of southern Great Barrier Reef, where the Capricorn race (Z. lateralis chlorocephalus) is resident and much larger (body weight 0.49-0.53 oz [14-15 g]) than the mainland races (0.3 oz [10 g]) that migrate. 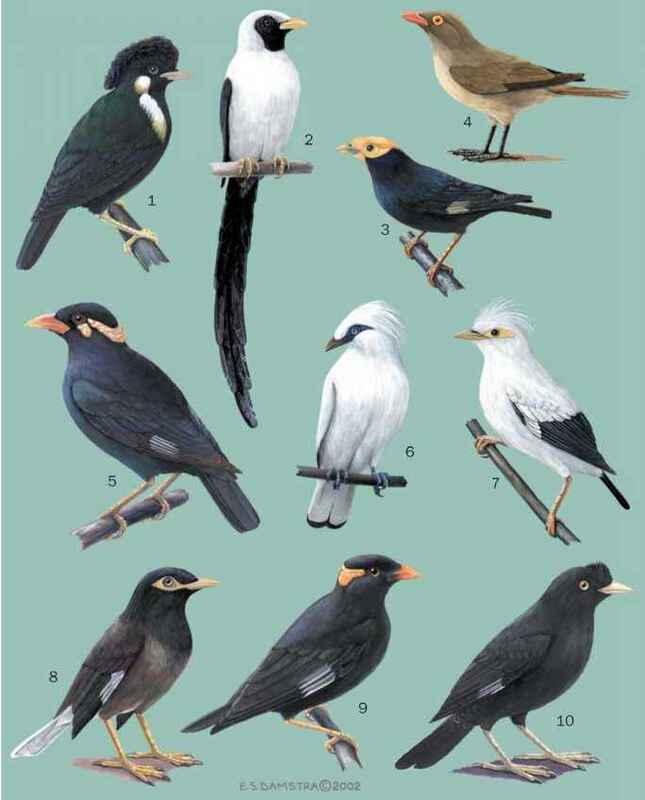 Another genus of this family, Lophozosterops, with six species, mostly mountain birds of Indonesian and Philippine islands (Java, Bali, Sumbawa, Flores, Sulawesi, Seram, and Mindanao), contains not only very large species (wing greater than 2.8 in [70 mm]) but also atypical forms. They have a gray or brown crown, which is often striped or has small white spots. One species, Lophozos-terops dohertyi, has a crest. In the giant white-eye, Megazos-terops palauensis, of Palau island, the wing length reaches 3.3 in (85 mm) and weighs up to 1.1 oz (31 g). 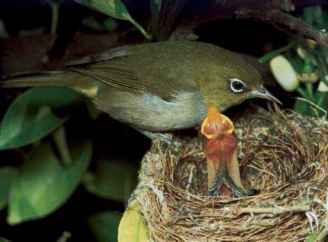 In the mountain blackeye, Chlorocharis emiliae, of northern Borneo and Bonin white-eye, the feathers around the eye are black.